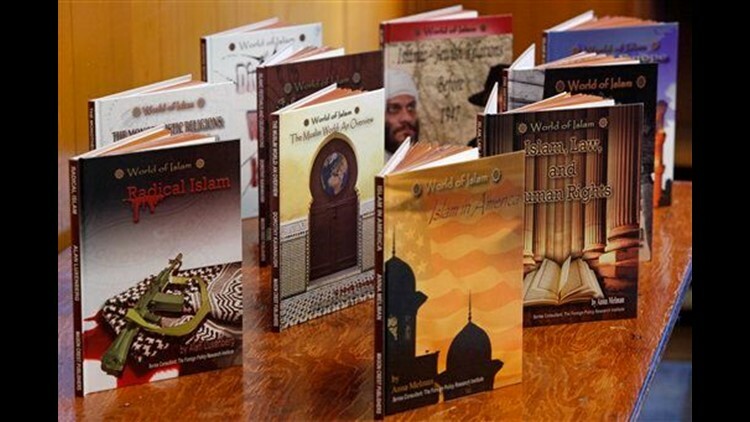 PHILADELPHIA (AP) — A series of children's textbooks on Islam contains misleading and inflammatory rhetoric about the religion, inaccurately portraying its followers as inherently violent and deserving of suspicion, according to a Muslim civil liberties group. The Pennsylvania chapter of the Council on American-Islamic Relations began what it calls a public awareness campaign Wednesday against the "World of Islam" books by Mason Crest Publishing. "This is not about Muslims being offended," Moein Khawaja, the chapter's civil rights director, said at a news conference. "Filled with incorrect information and deception, these books are contrary to the education mission of schools and libraries." It was not immediately clear where the series is being used, but Khawaja said complaints from council chapters across the country lead him to believe it is on bookshelves in about two dozen states. Mason Crest partnered with the Philadelphia-based Foreign Policy Research Institute to produce the 10-book series, which is designed for ages 10 and older. Institute vice president Alan Luxenberg, who wrote a book called "Radical Islam" for the series, defended the texts. "They're taking things out of context to paint a picture that misconstrues the meaning of the books," Luxenberg said Wednesday. Among at least two dozen examples cited by Khawaja, the book "Muslims in America" says that "some Muslims began immigrating to the United States in order to transform American society, sometimes through the use of terrorism." Elsewhere, a picture of two smiling Muslim girls in head scarves appears on a page subtitled "Security Threats." Khawaja asked "socially conscious people of all faiths and backgrounds, who value an objective and proper education for America's children" to check local libraries and schools for the books. If found, he suggested exchanging them for another Mason Crest series called "Introducing Islam," which he said was written in consultation with Muslim scholars and is a fair portrayal of the religion. Or, he asked people simply to donate the "better" series. The publisher, based in the Philadelphia suburb of Broomall, did not return a request for comment. Foreign Policy Research Institute president Harvey Sicherman said Tuesday that he is mystified by the reaction to the series, and that Khawaja's two examples are misleading. The photo placement near the subtitle was inadvertent, he said, and the caption in no way implies the girls are security threats. The quote about Muslim immigration to America is accurate, Sicherman said. "Well, yes, some people did come to the United States to commit terrorism, and I don't know how one can quarrel with that sentence," he said. The institute cited several passages that it says shows there is no anti-Islamic bias in the books, including a description of Muslims as "an integral part of the American mosaic" and the statement that "the great majority (of Muslims) reject the Islamist interpretation of their religion and are horrified by the idea of living under an extremist Muslim society." Khawaja said the problem goes beyond isolated sentences to what he described as the series' overarching anti-Muslim tone and message. "A book isn't just a set of quotes — it's a conclusion you walk away with," Khawaja said. He noted that a chronology in the book "Islam in Europe" starts with 1988 and lists 10 events, seven of which involve extremist Muslims participating in bombings, hijackings or other violence. "Muslims have been in Europe for thousands of years," Khawaja said. "This is ridiculous." Luxenberg said that while "maybe the chronology is too short," the overall book is even-handed. "I don't think we should be labeled as anti-Islamic," he said.